Although each child is different, homeschooling boys is sometimes a bit different than homeschooling girls. I love my boy and have really enjoyed watching him and working with him to help him learn what he needs to learn. People say that boys hear, see, and think differently than girls. While that may be true, I will share some principles that you can use for homeschooling boys and girls to help you understand them better and help them develop a love for learning. Here's how to avoid burnout and have a successful homeschool year. Learning Style - In my opinion, knowing your child'slearning style is crucial to homeschooling. If your child is an auditory learner, then there is no point in giving him a huge pile of workbooks and textbooks and expect him to be able to learn. There is more to learning style than just the usual visual, auditory, kinesthetic styles as I found out when I did a homeschool learning style assessment for each of my children. I have arranged with the publisher to give my readers a discount. You can also listen to an interview I did with her that explains all about learning style assessments and the success that the author has had with thousands of students. Goals - Think about your goals for homeschooling. Do you want to recreate a classroom and do "school-at-home"? Do you want to homeschool for a year or two and then send your child back to public school? Is your child advanced to the point that you want to help him move forward at his pace? Is your child struggling with reading to the point that you want to focus on helping him be a good reader? 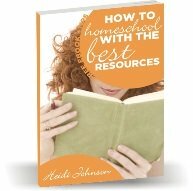 Knowing your goals and reasons for homeschooling will help you immensely when planning out your year. This will help you develop a vision for where you want your child to be at the end of the year. If you can see where you want to be at the end of the year, it will help you be able to get there. If you have no idea or vision for what you want to accomplish for the year, there is a good probability that you will have a difficult year. Curriculum is NOT your master - This took me a long time to learn so I am going to mention it here to save you some frustration. Realize that curriculum is a tool you can use. You do not have to be a slave to it just because you spent money getting it. Your relationship with your child and how they view learning are much more important than finishing a book that you purchased. Trust your Mom instinct and Be Flexible - You know your children better than anyone. If you have a feeling that something needs to change or something needs to stay the same, then stick with that and keep the best interest of your children at the forefront of your actions. Homeschool moms learn SO much from their children. Be flexible enough to listen to them and adjust where needed. Help them with their Dreams - Many children have dreams, but often boys, being wired to be the family leaders, develop their dreams and vision early in life. By exposing your children to different experiences, you can help them develop a sense for what they enjoy and what they don't enjoy. If your son loves building Legos, then take that extra minute or two when you are near a construction site to let him watch and learn. Get books out of the library that you know will be interesting to him. Make sure you expose him to new things too so that he can open his mind to the world around him. The Successful Homeschool Family Handbook - an older book, but well worth reading! Although boys and girls ARE different, homeschooling boys doesn't have to be a negative experience. Boys are wonderful and creative people. The sooner we accept them for who they are and work with them to help them thrive, the better off the whole family will be.